The Hadassah Foundation has awarded $330,000 in grants to 21 Israeli organizations that enhance economic opportunities for women in Israel. 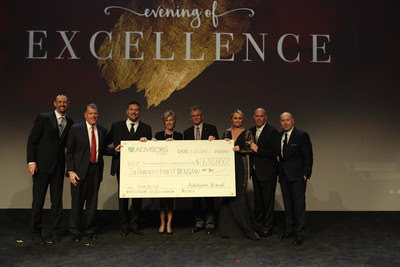 The Leukemia & Lymphoma Society raised $630,000 at an Advisors Excel event. The funds will go to support research on blood cancer. The Corporation for Enterprise Development (CFED) and The Prudential Foundation gave a $1 million, two-year grant to support the Campaign for Every Kid’s Future, the cornerstone of CFED’s Children’s Savings program. The Wyss Foundation will commit up to $65M to the South African-based conservation organization African Parks to support the protection and management of four existing parks in Rwanda and Malawi. Petland stores nationwide raised more than $130,000 during the 2016 St. Jude Halloween Pin-Up Promotion benefitting St. Jude’s Children’s Research Hospital. Efforts to eliminate blinding trachoma as a public health problem in the West African nations of Mali and Niger will receive US$11.725 million in additional support from the Conrad N. Hilton Foundation, to be implemented by The Carter Center, Helen Keller International, and Sightsavers. The Semper Fi Fund has raised a total of $20 million in its annual “Double Down for Veterans” fundraising challenge. The campaign ran for two months, with The Bob & Renee Parsons Foundation pledging to match all donations up to $10 million. The Yerba Buena Center for the Arts appointed Karen Wickre and Jeff Chang to the Board of Directors. Eating Disorder Hope began new membership opportunities and online forum to kick off National Eating Disorders Awareness Week 2017. National Braille Press awarded the 2017 Louis Braille Touch of Genius Prize for Innovation to John Hudelson for his submission of the Braille Early Learning and Literacy Arcade. The Explorers Club Board of Directors has named George Basch, 80, founder of the Himalayan Stove Project, recipient of its 2017 Explorers Club Citation of Merit. On February 24th, the National Hispanic Media Coalition (NHMC) honored contributions to the positive portrayals of Latinos in media at the 20th Annual NHMC Impact Awards Gala. The Audre Lorde Project‘s membership support team hosted the third session of The OUTsiderz series, where 17 members learned skills for facilitation of dialogue and participation. The session was co-led by Ashleigh Eubanks, a core member of The Safe OUTside the System Collective. The Beltway Non-Profit Thursday gathering was held on Thursday, March 2nd and brought together a group of top Executive Directors and CEO’s of America’s $3 million-dollar a year plus charitable organizations to explore how to successfully fund-raise based upon the latest data. The event was hosted by Bridge Philanthropic Consulting. The Ralph C. Wilson, Jr. Foundation has added James Jacobs, Ph.D. as a senior advisor to the president & CEO. The Johnny Mercer Foundation (JMF) has teamed up with Kaufman Music Center for JMF’s sixth consecutive year of the Accentuate the Positive program, which teaches elementary school students the art of songwriting and introduces them to The Great American Songbook. The Walton Family Foundation will partner with the U.S. Agency for International Development to improve Indonesia’s marine biodiversity conservation through better monitoring of deep-water fisheries and management of ocean resources. The Wallace Foundation has selected Giselle “Gigi” Antoni, president and CEO of Big Thought in Dallas, as the new director of learning and enrichment. She will oversee one of the foundation’s key grant making areas. The Chanda Plan Foundation will welcome Alexandra Reeve Givens, Board member of the Christopher & Dana Reeve Foundation, as emcee of its 12th annual Big Event fundraiser on April 20th. In honor of what would have been Elizabeth Taylor’s 85th birthday on February 27th, The Elizabeth Taylor AIDS Foundation released a short video to celebrate her legacy. The Coca-Cola Company, Nestlé Waters North America, the PepsiCo Foundation and the Walmart Foundation are partnering to fund an integrated recycling education and awareness initiative for all 10,000 Flint school students, led by national nonprofit Keep America Beautiful and its local Flint, Michigan, affiliate Keep Genesee County Beautiful. The National Military Spouse Network, in its effort to continue to educate, mentor and inspire military spouses, announces its inaugural Roadshow with events taking place in three states around the country. The National Coalition of Nonprofits has launched a campaign to oppose the repeal of the Johnson Amendment, and is encouraging organizations across the country to add their names to the Community Letter in Support of Nonpartisanship. Generation Harvest will host a charity ride at SoulCycle on Saturday, March 11th. Proceeds benefit City Harvest and will help rescue surplus food and deliver it to soup kitchens and food pantries across the New York City. On Tuesday, April 4th, the Center for Philanthropy & Public Policy at University of Southern California will host “Philanthropy: Using All Available Means,” a talk by Julia Stasch, President of the John D. and Catherine T. MacArthur Foundation. Walking Mountains Science Center will host an array of science camps for children entering 1st-12th grade this summer. Open registration for all camps begins March 6th. The Community Chest‘s 2016-2017 Professional Development Series will present Effective Leadership on Monday, March 13th. Speaker Sharon Thomas, LPC will present the workshop at the Vantage Health System Training Center in Dumont, New Jersey. On May 4th, CYCLE Kids will host the Spring Classic. All proceeds will benefit local CYCLE Kids programming. On March 22nd, the Founder & Customer Service Representative of Craigslist and craigconnects, Craig Newmark, will speak at the Women’s Entrepreneurship Day’s Core Breakfast Series. Newmark will speak on his support of multiple tech organizations for women such as Feminist Approach to Technology, The Woman Building, Black Girls Code, Global Fund for Women, Girl Develop It, Women’s Annex Foundation, and Girls Who Code. Whole Planet Foundation launched its 2017 Prosperity Campaign to raise funds to support microfinance organizations and microcredit loans. This year’s campaign aims to raise $3.2 million to give entrepreneurs in the U.S. and abroad an opportunity at a better life.